Judicious marketing means British Gas’s ‘Hive’ smart thermostat is becoming a recognisable brand in the UK. That said, I wasn’t overly impressed. On its default setting Hive is little more than a thermostat and hot water heater that you can control remotely from a phone or web browser. This gives you easy access to scheduling, but otherwise offers little benefit compared to a standard thermostat. Dig deeper into settings, however, and this changes. 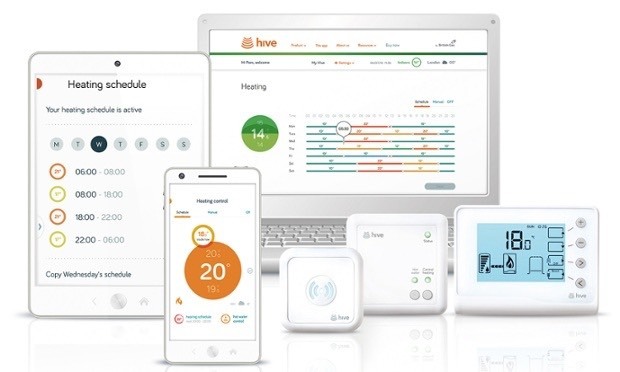 Hive can track homeowner locations and adjust heating accordingly, but British Gas has disabled it by default saying it wants customers to actively opt in if they want their location to be monitored. That said, even switched on it lacks the intelligent learning of Nest and Tado (more next) and looks plain. Like all models, except Nest, Hive also requires a dedicated ‘internet bridge’ – a separate box, which is physically wired to your router at all times, to provide the thermostats with an internet connection. Nest avoids this by having Wi-Fi built into the controller. On the plus side Hive is cheap and it does bring savings – around 15% during our three months using it – and we suspect more could be found from owners with fixed routines. Still we’ll end with a negative: there is no British Gas tariff integration and that’s plain boneheaded. Another view on Hive, from Adam Vaughan: I’ve not tried the alternatives, but I’ve been largely impressed by Hive. Installation by the British Gas installers was quick and painless, and I like the fact hot water control is included as standard, even if it’s not a control you’d fiddle with as often as space heating. The IOS app is fairly fast, easy to use and has recently been updated so you can set as many as six different heating schedules across each day. The geolocation feature works well enough, sending you a push notification on your phone when you leave or arrive in a fixed radius from your home, but requires too much human intervention. Every time I cycled to work it would ask me if I was leaving home, which became an irritant so I switched it off in the end. Also in the negative column, the wall-mounted thermostat is dowdy and not the world’s most intuitive.